to be fair they also played some terence trent darby. When we were last there we got a big, loud blast of "Honky Tonk Badonkadonk." 60654 wrote: to be fair they also played some terence trent darby. I dined there last night. I would have KILLED to hear my boy TTD'A. Regardless, it was one of the most pleasurable dining experience of my adult life. Unlike any other. The service was perfect, the food was remarkable, minus the fish courses, which weren't my favorite. I imbibed like a muv' so please disregard my foggy dome. Some standouts: The 2 Pasta courses, Quail Egg Rav, Tortalloni, The Pheasant was outstanding, the French Onion Soup on a stick, the Manhattan Amuse with the cherry covered chocolate. Dr. Pepper Dessert with a side of a can of Dr. Pepper. Did the 9 course and got served about 14. Everything was heavy on salt in a good way and perfectly rich. Music was primarily Jack White, Loretta Lynn & Das Racist. Perfect. Chef Carlson & his crew were on point and we shared a shot of the 12 year Jameson I brought for the boys in back to cap the night. Went in mid June and stopped by Cellar Rat 15 minutes before our seating. I don't remember the specifics of what the guy picked out for us but it was a sparkling, a white, and a red. I'd say we could've gone with another white instead of the red, and Vinny did mention over the phone that the current menu is very white-friendly. I'd have to agree, but the choices the Cellar Rat guy made fit well since Schwa orders wines from him and he knows their tastes. 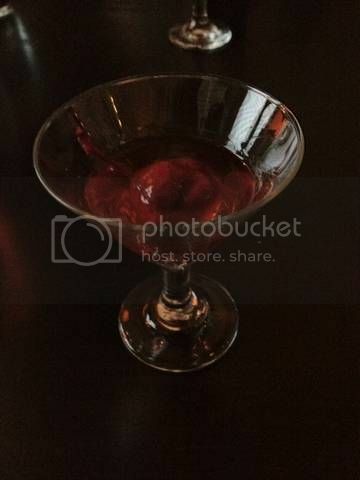 Chocolate Cherry Manhattan – The amuse. What looked like a chocolate-covered maraschino cherry was actually cherry-flavored chocolate. The faux cherry swam in little pool of cocktail. Orange Coriander Soda – This served as a chaser to the Manhattan. It was very refreshing and aromatic. Pig Face Cassoulet Salad – The salad course. I found it pretty hilarious that Schwa took a rich, heavy casserole and made it into a salad course. Despite being called a salad, there weren’t that many greens on the plate. It consisted primarily of beans, so perhaps the “salad” descriptor was meant to convey that it was a bean salad. Regardless, I didn’t find this dish as heavy as traditional cassoulet and the pig face was very flavorful. Baked Potato Soup – The soup course. This was described as an homage to the Wendy’s baked potato bar. The potato formed the base of the soup and was garnished with a chive puree, bacon, bacon puree, sour cream, truffle, and a long strip of amazing gooey choose from Utah. 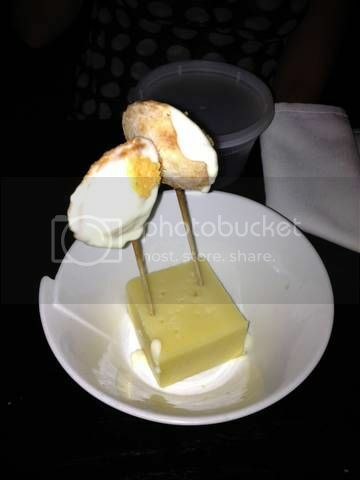 It tasted like the greatest baked potato ever and reminded me of the “hot potato, cold potato” dish at Alinea. Quail Egg Ravioli – An extra course. Somewhat of a Schwa signature dish. A perfectly cooked ravioli filled with a runny quail egg yolk. 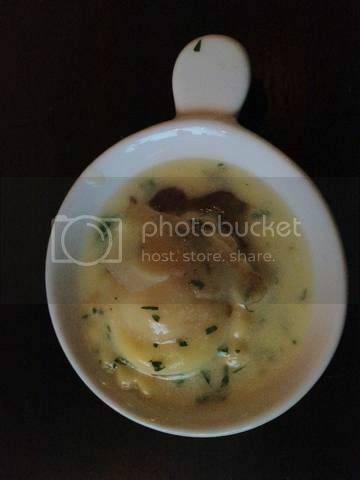 The ravioli was glazed with butter, herbs, and I believe truffle oil. Rich, velvety, buttery, earthy. 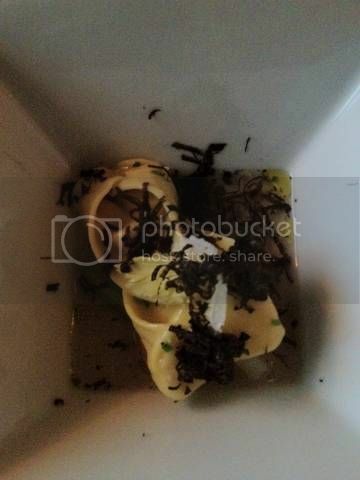 Celery Root Tortellini with Celery, Green Apple, & Truffle – The pasta course. This was my favorite dish of the night. It was also the most interesting dish of the night in terms of flavor combinations. The celery and green apple went so well together while the truffle added a big savory note. The tortellini were served atop a green apple reduction. The green apple reduction was perfect because it was a great substitute for something like tomato sauce: both are acidic and sweet. The reduction reminded me of Spaghetti-O’s sauce. I should note that I love Spaghetti-O’s. Fruit Loops – The roe course. Blis steelhead roe with passion fruit gelee, pickled papaya, and violet foam. Yes, it smelled and tasted like fruit loops with roe. No, it was not gross. It was amazing. When I stopped to think about the combination, I wondered why I’d never seen something like this before because it makes complete sense. 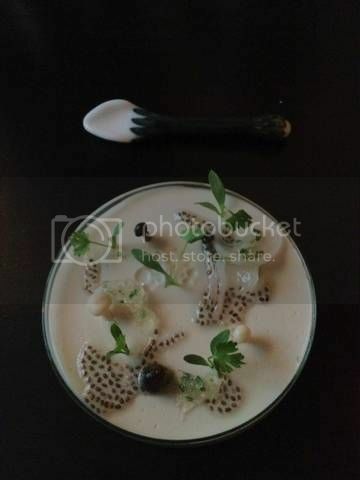 The tartness and sweetness from the passion fruit work as a great foil to the saltiness and brininess of the roe. Oyster with Oatmeal – An extra course. Carlson invited us back into the tiny kitchen to chat while he prepared this dish. The oatmeal sort of looked like vomit, but that didn’t matter at all because the single bite of oyster with a bit of oatmeal and some type of fruit was outstanding. There was a great contrast between the briny and earthy flavors. 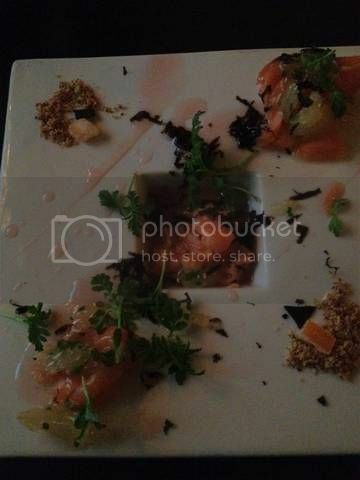 Salmon with Pink Lemonade, Grapefruit & Truffle - The fish course. Sous vide salmon with (if I recall correctly) a pink lemonade gelee, candied grapefruit rind, and truffle. Nothing wrong with the dish, but nothing too exciting either. It boiled down to a well cooked piece of fish with some citrus. Curry-Crusted Foie Gras with Kumquat – The offal course. 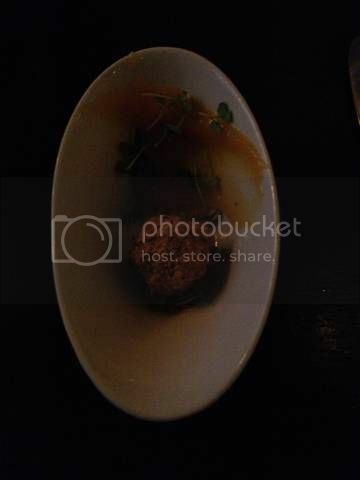 Foie gras was shaped into a small ball and coated with an intensely aromatic curry powder. I can’t remember how the kumquat was prepared, but I’m guessing a jam or puree. The foie gras and kumquat combination I immediately understood, but the addition of curry is why the guys at Schwa are geniuses and I’m not. It just worked. After much pondering, I came to the conclusion that kumquat and curry went well together because coriander and citrus are a natural pairing. Coriander is in curry powder and kumquat is a citrus. Pheasant with Popcorn & Bourbon – The meat course. 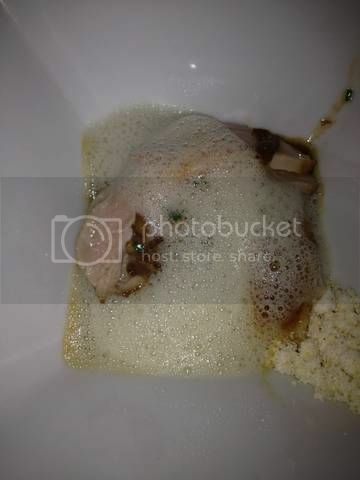 Confit pheasant leg and roasted pheasant breast served over a popcorn/bourbon sauce topped with popcorn and popcorn foam. I understood the pheasant and bourbon pairing after having bourbon chicken countless times at mall food courts, and the combination of popcorn and bourbon almost reminded me of caramel popcorn. This was an interesting dish and no doubt tasty, but I wasn’t wowed like I was with most of the other dishes. Rice Krispies Treat with Horchata – An extra course. As far as I could tell, a traditional preparation of a Rice Krispies treat. It may have had spices such as cinnamon to compliment the excellent horchata, but I honestly can’t remember. Much later, I realized how natural it was to pair a Rice Krispies treat with horchata: both are made from rice. French Onion Soup – The cheese course. Imagine a lollipop where instead of hard candy there’s a pie crust. Inside the pie crust were caramelized onions and cheese. It tasted like French onion soup in pie form. Dr. Pepper – The dessert course. Dr. Pepper was deconstructed into a dessert consisting of some type of ice cream, vanilla foam, carbonated prune, prune puree, cherry sauce, a short bread cookie, and other things I can’t recall. When eaten all together it tasted like Dr. Pepper. How could I tell? Because they served it with a glass of Dr. Pepper. 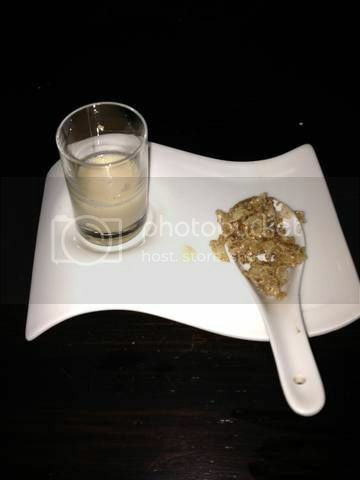 conor610 wrote: Rice Krispies Treat with Horchata – An extra course. As far as I could tell, a traditional preparation of a Rice Krispies treat. It may have had spices such as cinnamon to compliment the excellent horchata, but I honestly can’t remember. Much later, I realized how natural it was to pair a Rice Krispies treat with horchata: both are made from rice. I was there in July and had a very similar menu... I had forgotten about this course, but you jogged my memory. As memory serves, the "rice krispie" was made of dried parsnip flakes, and the horchata was made from parsnip milk. It was a really cool course. xlrbnc wrote: I was there in July and had a very similar menu... I had forgotten about this course, but you jogged my memory. As memory serves, the "rice krispie" was made of dried parsnip flakes, and the horchata was made from parsnip milk. It was a really cool course. Thank you for the clarification. I'm a big fan of root vegetables in desserts. We didn't get any explanation other than "here's a Rice Krispies treat and horchata," so I incorrectly interpreted that literally. I didn't remember anything that made this course unique when recalling the flavors from the meal, but I wonder if knowing about the parsnip while eating it would've made me enjoy it more. However, I do recall the texture being pretty much like a classic Rice Krispies treat. Knowing they were able to get that texture out of dried parsnip flakes is pretty neat. 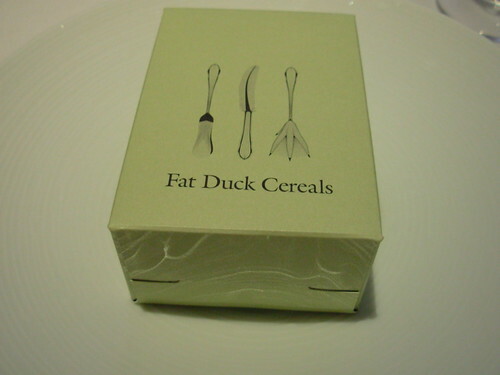 That parsnip dessert seems a take-off (an homage) to a dish served at the Heston Blumenthal's Fat Duck, presented near the end of the meal. Corn Flakes in Milk, but as at Schwa the corn flakes were parsnip flakes and the milk was parsnip milk. I found the small dish "cute," but not remarkably delicious. It rather tasted like corn flakes, and why go to that trouble for an idea. I know its been mentioned in past post. But does anyone with any recent menu experience have any good ideas on beer/cider pairings? I'm thinking at least one cider, and a bunch of beers. Any help would be awesome! Thanks! in a tweet, The Hungry Hound wrote: Knew was too good to be true. After confirming res yesterday w/me for 8 ppl, Schwa just left msg 2 hrs b4 res saying they're closed tonight. Bspar wrote: I know its been mentioned in past post. But does anyone with any recent menu experience have any good ideas on beer/cider pairings? I'm thinking at least one cider, and a bunch of beers. Any help would be awesome! Thanks! And with Mel's latest experience, an alternative reservation at a place that's reliable. Oops, my bad. I thought it was yours. Well, someone won't be getting a signed headshot anytime soon. A bit of a letdown tonight at Schwa. No drama in terms of cancellations or what not and the food was very good - but was overly tame of an experience. Part of the allure of Schwa is having some drama and an out of the box experience. Chef Carlson tonight never left the kitchen area and other than some racy lyrics on the soundtrack, the experience tonight was very PG-13. It was nice that the menu had significant changes from my last meal there this past winter (only about a third of the dishes were the same), but the ambiance was just meh. 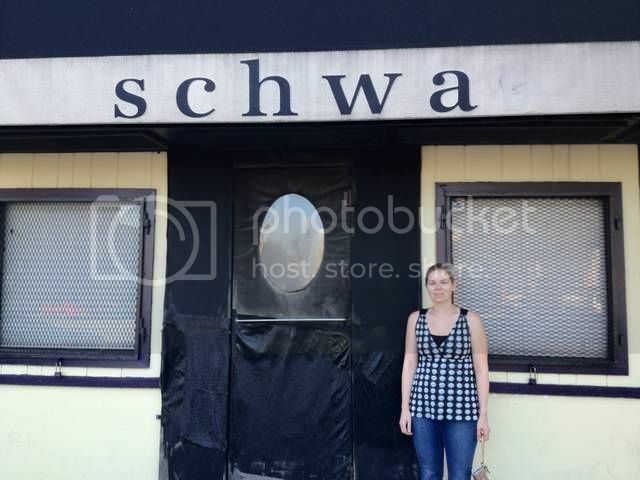 Chef Carlson's brother apparently has left Schwa for Next and the servers we had tonight were friendly enough, but it was not the traditional Schwa experience - it seemed rather sterile. Apparently Chef Achatz was in house the night before, but tonight they were not even at capacity and was not anywhere near the high energy experience I received several months ago. As Chef Carlson is so incredibly talented I definitely will return in 2013, but tonight's toned down Schwa experience was a tad disappointing. Gonzo70 wrote: A bit of a letdown tonight at Schwa. No drama in terms of cancellations or what not and the food was very good - but was overly tame of an experience. Part of the allure of Schwa is having some drama and an out of the box experience. Chef Carlson tonight never left the kitchen area and other than some racy lyrics on the soundtrack, the experience tonight was very PG-13. I guess this can happen there--it matches up with my one experience. It was perfectly fine, the food was good--but most of the reports I read here make me wonder what was wrong on the night we and our friends were there! There were no Chef-mingling, no loud punk rock, no "insane" (in a good way) flavor combinations on the menu. We all found it enjoyable but most definitely inside-the-box. Since there has not been a photo review of Schwa for a while, I figured I would do a recap of my dinner last night - as I posted after my meal the food was very good, but I left a bit disappointed as the atmosphere was boring and the restaurant lacked any passion and energy (not only were there no fireworks, but there wasn't even a spark of energy emanating from the kitchen or front of house) - which is the opposite of what one would expect at Schwa and totally different than my previous meal here. My wife standing outside the entrance. 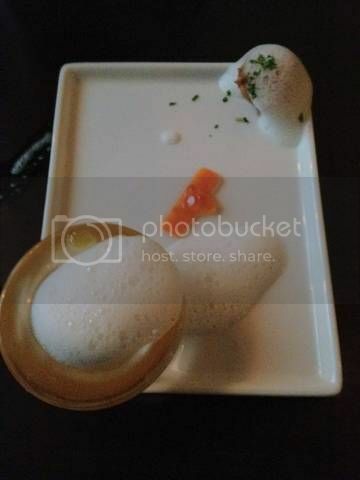 Thai Soup - This tasted like Tom Yum Soup but was in pudding form and served inside a petri dish. 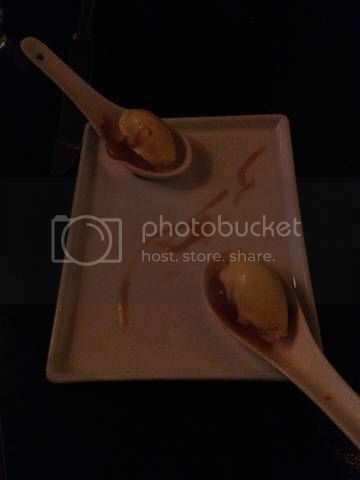 The serving utensil was pretty cool looking and the dish looked beautiful. The first few bites were very flavorful and it did indeed taste like Tom Yum soup, but it actually was too generous of a portion. The consistency was a bit pasty and after a few bites the flavor lost it's pop and it became a bit bland and heavy. Counting the amuse we received a total of thirteen courses, so as usual a few extras (you are offered a choice of nine or three courses when you arrive). We had brought the chefs a gift of some home brews (it is an unwritten rule at Schwa to bring the chefs a gift of some sort of booze); during my last visit they seemed really excited about this (as typically they receive Jameson, so I thought it would be fun to bring something different), but on this occasion they seemed disinterested. The food was nearly as good as during my previous visit and as expected for Schwa features a lot of interesting flavor combinations (that generally work), heavy on the truffles and sauces and a sweet component to most of the savories. I love Carlson's boldness with playing with different flavors and his creativity. I just was sad that he was so introverted tonight and did not leave the kitchen or interact at all with the patrons (during my last visit he served us at least five of the courses and was rather chatty). Perhaps he was in a somber mood due to his recent fireworks arrest, but he is known for being rather moody - so unfortunately I just caught him on the wrong night. I also missed the presence of Chef's brother (who is now working at Next). Tonight all of our courses were served by what appeared to be dedicated waitstaff rather than by the chefs. They were cordial, but somewhat disinterested (they often had their bodies turned to the side as they were describing the dishes and would start walking away before they even finished their last sentence - and at times they seemed to stumble over some of the descriptions). Also lacking in the service area was no bucket was brought to our table to chill our sparkling wine or beer that we had brought and I was not brought out a fresh glass once I switched from wine to beer (even though I had requested a bottle opener, so it was obvious I was about to commence drinking beer). Service was nowhere near what one would expect from a Michelin starred venue; while Schwa is anything but a typical Michelin starred restaurant, I still expect a higher level of service for food of this caliber and price point (the nine course tasting menu runs $110; a good deal considering the uniqueness, quality, number of courses and BYOB factor - but still service needs to improve as service like we had really puts a damper in one's experience). There are plenty of venues in Chicago with great food; while Schwa adds a lot of creativity and uniqueness to the mix, part of the allure of Schwa is the interaction with the chefs and this (in addition to some subpar service) marred the experience to an extent and this visit ranked far below my prior visit. Schwa is still a great venue, but one does have to be prepared for drastically inconsistent experiences from visit-to-visit. I plan to come back some time in 2013, but this will be more of a once-a-year venue for me. Last edited by Gonzo70 on August 19th, 2012, 3:34 pm, edited 6 times in total. Gonzo70 wrote: Since there has not been a photo review of Schwa for a while, I figured I would do a recap of my dinner last night - as I posted after my meal the food was very good, but I left a bit disappointed as the atmosphere was boring and the restaurant lacked any passion and energy (not only were there no fireworks, but there wasn't even a spark of energy emanating from the kitchen or front of house) - which is the opposite of what one would expect at Schwa and totally different than my previous meal here. I think you may have caught Michael at the end of a difficult week. robert40 wrote: I think you may have caught Michael at the end of a difficult week. Thanks Ronnie. I tried resubmitting the images via editing my original post. Please let me know if you can see them now (I was able to see them before on my desktop, but not on my iPhone; now they are visible on both - so hopefully it worked). Gonzo70 wrote: Thanks Ronnie. I tried resubmitting the images via editing my original post. Please let me know if you can see them now (I was able to see them before on my desktop, but not on my iPhone; now they are visible on both - so hopefully it worked). Yep, thanks. And thanks, for the detailed report. Wow, ended up seeing Chef Carlson twice in three days; I am in a Monday night bowling league and he was there bowling when I showed up! I kind of struggled tonight too; he probably could have out bowled me! I wonder what he thought of the food at Diversey Rock n' Bowl. Maybe he special ordered a quail egg pizza. 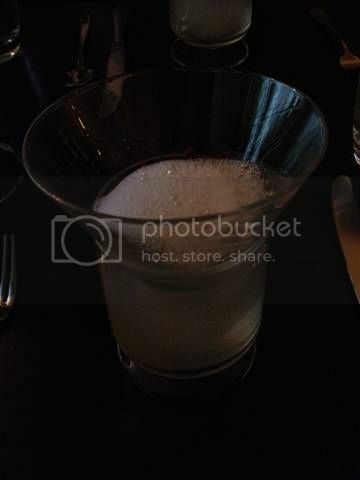 Had my B-day dinner at Schwa this past Friday. Beer worked pretty well with the menu. It was certainly the most fun I have had a dinner in a long time. 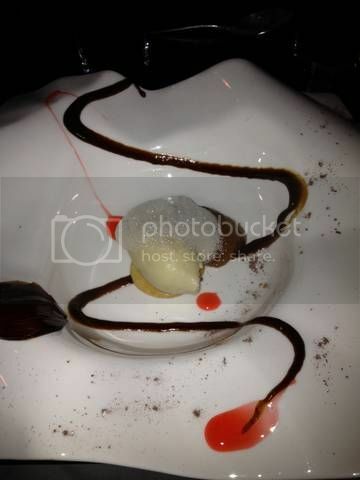 The service was great, the food was fantastic, and the atmosphere was out of this world. I think you need to know what you are going in for, and just be ready to go on the ride that the kitchen takes you for. I was there Thursday. Lets say with less then a 24 hour notice it was a very quick road trip. Had a awesome time! And can't stop thinking about the pork belly served with kimchi and watermelon. Dish of the year so far. I can't help with the current menu, but you might want to make sure you bring plenty of wine and some money for a trip to a restaurant afterwards. According to this new thread over on the Wine Berserkers website, some folks who went there last Saturday only got about half their dinner before the restaurant ran out of food. Michael and the staff just sat around with the guests drinking the wines that had been brought, and then some folks went to Weiner Circle for dinner. Priceless! Yikes, thanks for the heads up. I do have a Plan B in case my reservation gets cancelled before I show up. I will report back.